There are many potential explanations for this, including eroding union penetration and bargaining power, falling federal and state minimum wages, rising trade pressure stemming from China’s rise as a manufacturing power, and changes in employer practices that decouple the wages of less-educated workers from the productivity and profitability gains of their employers (Card 1996, Lee 1999, Autor et al. 2013, Weil 2014, Autor et al. 2016). Figure 4 shows that this has indeed occurred. 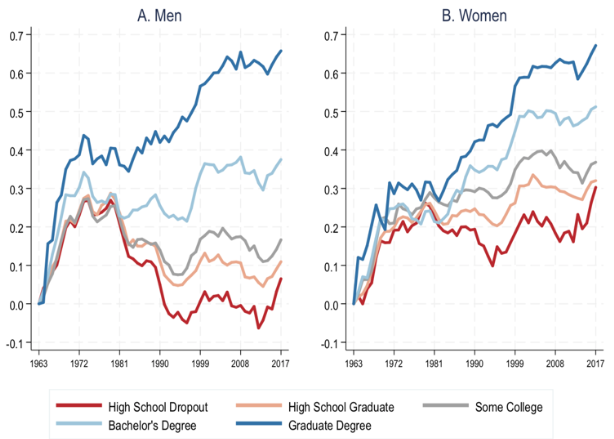 Between 1990 and 2015, the urban wage premium among non-college workers declined by roughly two thirds, even as the urban wage premium among college workers steepened. A similar pattern is documented by Baum-Snow et al. (2018). 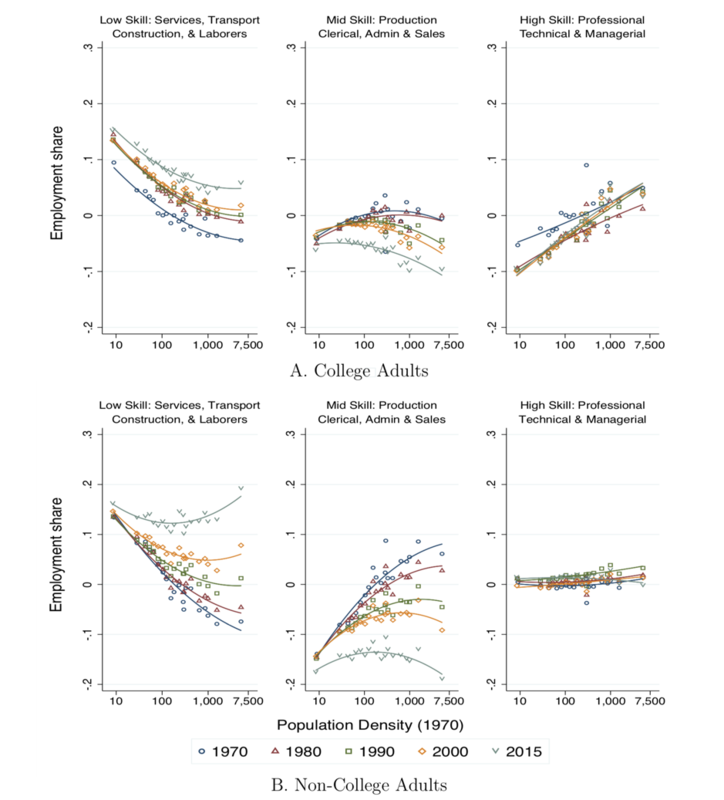 As I demonstrate in Autor (2019), this striking pattern is not driven by other obvious confounds such as changes in age structure in urban areas, shifts in the educational composition of the broad ‘non-college’ category, lingering after-effects of the Great Recession, or artefacts of the rising immigrant share of urban workers. Rather, it appears to be a genuine change in urban wage structures. In short, occupational polarisation has disproportionately occurred in high-wage urban and metro labour markets, and it appears likely that the geography of polarisation has magnified its wage impacts. which is the reason that the US needs a point-based/skills/degrees-based migration system. the US has a near permanent trans-identity non-skilled worker class who need help first. but i’m not holding my breath as that’s the third rail of progressive politics–among many. George Mason University’s Schar School of Policy and Government has received a $1.1 million gift from the Charles Koch Foundation to pursue research on immigration, population change and labor markets. The five-year grant supports Mason’s Center for the Study of Social Change, Institutions and Policy, led since 2003 by Professor Jack A. Goldstone. The grant will fund research by at least five new PhD fellows, center operating expenses and—beginning in fall 2019—an annual workshop on the impact of demography and migration. •how to maintain the productivity of older workers and address the fiscal challenges of containing health and pension costs in countries with aging populations. The H1B temporary visa is capped at 85,000 per year. If you’re referring to refugees, the US government already has a legal as well as moral obligation to take them which it is failing to fulfill anyway. I’m upset that so many immigration advocates have tried to muddy the distinction between refugees and other immigrants. Of all the headwinds American workers are facing, legal immigration does not seem like a very great one. As for illegal immigration, it’s already illegal. If the government doesn’t want to pursue charges against all the American businesses that are recruiting people to be smuggled into the country, that’s another issue. I suspect that the higher wages urban areas for low skilled jobs are simply a matter of increased competition for workers. The low wage workers can more easily find other employment than those in low density areas. Fewer of them are going to be stuck in a crappy job with nothing else in a reasonable commute. I like David Autor’s work a lot. He has been one of the few economists to not just talk about data, statistics, and economic models, but to actually connect the research to social justice issues such as impacts on workers from globalization. Unfortunately, my reading of the above post seems to be your standard economist presenting data, statistics, and nice graphs without connecting the dots. Autor seems to even walk back previous assertions of the considerable impact of trade with China on the manufacturing jobs in the US, which is mentioned in the above links. 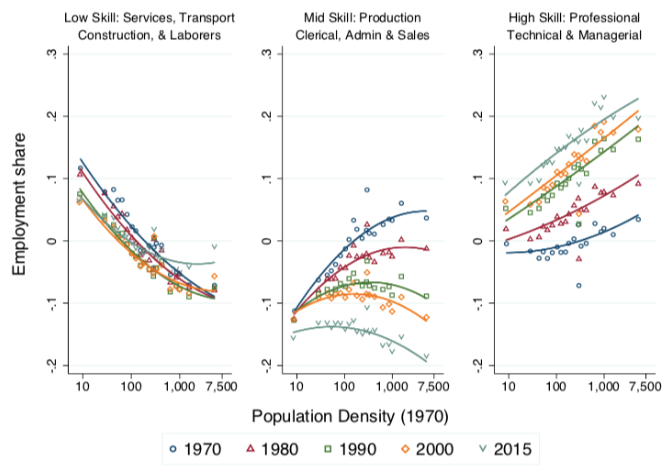 Autor’s research on the effect of trade with China on the exodus of manufacturing jobs in the US seems to be in conflict with his conclusion above that now states it is automation and technology. No matter what a person believes about the changes in the nature of work, globalization or automation, the important point which Autor’s post above misses is that these “changes” did not just fall from the sky. These “changes” were probably not chosen by the “people” i.e. democratic vote. The changing nature of work was due to policy decisions in government, and business and corporate decisions (without govt. input) that affected millions of workers. As Lambert has mentioned many times, the US lacks any semblance of an industrial policy. The lack of industrial policy is a conscious choice of the government and corporations, and not the the workers who are severely impact by the gutting of the US manufacturing base. Two more observations. One is Autor seems to place too much emphasis on the “college premium”. The post above and the conclusions could be applied to many people with a college degree as well. There are many people with college degrees who are grossly underemployed or not working at all. This is indicated by the feeding frenzy in the recent college admissions scandal. You do not just need a college degree (there is an excess supply of college degreed people), a person needs a degree from the elite colleges to have a chance at the Hunger Games competition that looking for a good job has become. 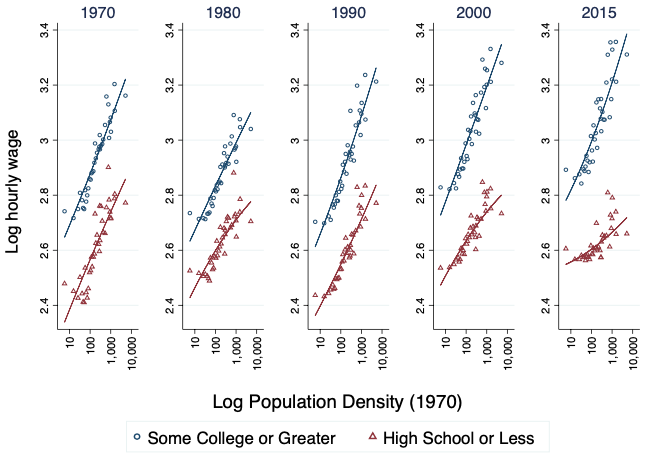 Secondly, this over focus on “college vs. non-college” also assumes there is some special characteristics or character traits that college degreed people possess. This could not be further from the truth. I have known many people who have a bachelors, masters, or doctorate degrees that are as dense as a brick and lack any common sense or problem solving ability. Educational reformers such as Ivan Illich and John Taylor Gatto have discussed the need for more vocational, hands on, and apprenticeship type education. The post above is akin to Lambert’s recent quote, ” I see your house is on fire, and I am here to listen”. Or the economist version, ” I see your house is on fire, and I am here to offer data, models, and graphs”. Re “There are many potential explanations for this, including eroding union penetration and bargaining power… (my emphasis).” This is stated as if this union diminishment were a natural phenomenon, like riverbed erosion, rather than due to massive opposition by the plutocrats. Reinstating the rights of unions is part of the solution to the imbalance of power created by the plutocrats. I’m just wondering here – looking at the horrors already upon us with climate change, specifically Nebraska’s road system being totally devastated by flooding – aren’t there going to be real, immediate needs for some kind of civilian conservation corps to cope with the extremes we know are coming? Won’t be a need for techies; will be a need for all hands on deck. The problem is those jobs require a high degree of skill too, and way too few people go into the trades to learn how to build roads anymore. Or anything else infrastructure related. Heck, I just spent all day on my roof because the last owners either had no idea what they were doing or the contractors they hired had no idea what they were doing. Basic skills like how to swing a hammer or make something water tight are missing in society. Advanced skills like laying down a road bed to meet a spec grade with the right materials are also missing. Ditto for intermediate skills like rough plumbing or building forms for concrete pours. Before we get to a place where we could have another go at a CCC, or a WPA, we need a practical skills teachers corps that can show all these people who have never done that kind of work how to do it. I’m not holding my breath we’ll see anything like that ever. I’m also not optimistic that the majority of the populace wants to learn how to do these things. Even if it’s to work on their own property. Chris, not many of the people who have the skills you describe can afford their own homes. Still, at least construction still teaches it’s members. If someone wants those skills, they can get a job and learn there. I will say teaching someone how to make something watertight is a lot harder than it should be, though…. See, the problem is, these skills didn’t used to be unique to the construction trades. Everyone knew how to use a saw, dig a hole, etc. People in construction were supposed to be better at those things, plus know other skills, and be more efficient and knowledgeable in those areas. In my opinion it’s just as worthwhile to make sure children learn these skills as anything like coding. And just like how an understanding of coding is being pushed at all levels, basic life skills like using a hammer and choosing the right nail should be pushed at all levels. In my experience, which is of course limited given the populace we’re discussing, the people with those skills are more likely to own their own property because the maintenance costs for them are substantially lower and because they can buy cheaper property which they renovate. Its frightening to walk around a Home Depot and see all these people buying things that they don’t know how to use and that might do serious damage to themselves. Or others! The author stated this in his intro but basically ignored it in the rest of the article; “changes in employer practices that decouple the wages of less-educated workers from the productivity and profitability gains of their employers”. I would append to that statement “government practices ” as well as “employer practices”. Since the 70’s government and business have made a concerted effort to weaken labor and citizen rights. Everything else the author discussed here could have been prevented if we had a government that was concerned about the general populations welfare instead of making the wealthy more rich.